George William Norris was born July 11, 1861, in Sandusky County, Ohio. He graduated from Indiana Normal College in 1881 and pursued a career in law and politics. After admission to the Ohio and Indiana bars in 1883, Norris established a law practice in Nebraska, where he also served as prosecuting attorney. 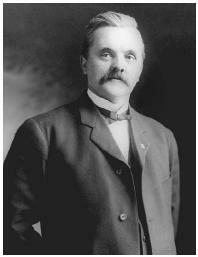 He presided as a Nebraska district court judge from 1895 to 1902.